This post is sponsored by Pampers and Luvs at Sam’s Club. All opinions are my own. It’s baby season! It seems like there’s an abundance of babies being born this month through fall, including two in our family! Both Akilah and Juicy are August and November babies, so we are part of that crew, too! An average of 12,250 babies are born every day in the U.S. during summer and early fall months. That means that these months are packed with baby showers, sprinkles and all things baby! I’m sure many of you are headed to baby celebrations so today I wanted to share a quick and easy diaper wreath DIY that I made for my sister-in-law who’s due in October! Diaper cakes intimidate me and wreaths are more of my thing, so that’s what I decided to do. I even opted for a smaller wreath form to help the project speed on by. Remember that Pampers diaper deal at Sam’s Club I was telling you all about? Well, they extended it through August 22nd and they’ve included Luvs in the offer, too! The deets: Receive $10 off the purchase of 2 Pampers or Luvs products, or $18 off a purchase of 3 Pampers or Luvs products. Just like last time, shipping and Club Pickup are free, or you can use the Sam’s Club Scan & Go app in-club to skip the checkout line on your way out. 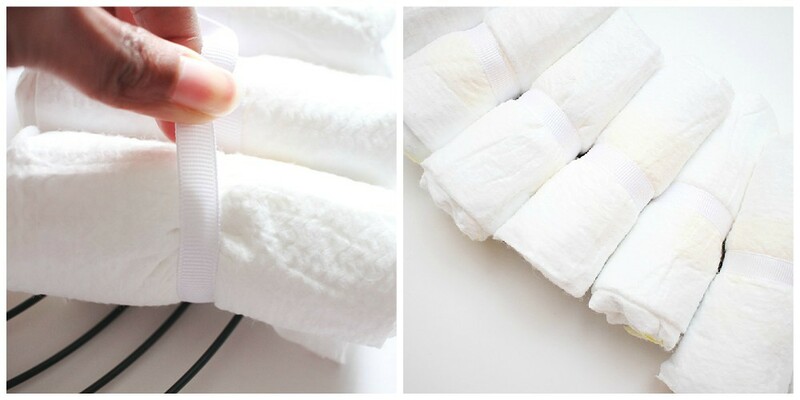 Next, crack your knuckles and roll up all your diapers (branded side in) and secure them with a clear rubber band. Cut a long piece of thin white ribbon. It needs to be enough to attach all of the diapers on to the wreath. No worries if you come up short. You can cut an additional piece and continue where you left off. Tie one end of the ribbon around the first diaper. Then, weave the other end of the ribbon through the middle of the wreath form and tie a knot around one of the hook areas. Now, you’re going to weave the ribbon through an opening and to the front side of the wreath form. Place another diaper next to the first diaper and wrap the ribbon around that diaper and through to the back of the wreath form. Weave the ribbon back to the front and repeat this process as you add each additional diaper. Once all the diapers are attached to the wreath, begin weaving your accent ribbon(s) around each diaper. 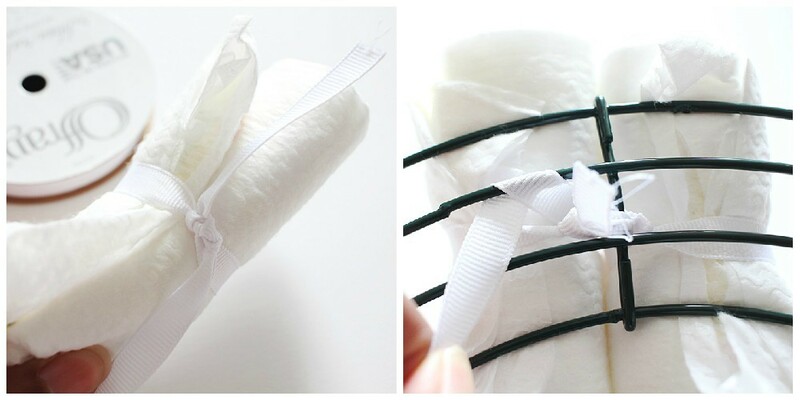 Start by wrapping your accent ribbon completely around one diaper and hot glue it in place. Be careful not to glue the actual diaper. Continue wrapping ribbon in a pattern; under the next diaper, over the following diaper until the wreath is completely wrapped in ribbon. If adding additional ribbon, follow the same steps, but start toward the inside of the wreath and on a diaper that hasn’t been wrapped in the accent ribbon. Once your wooden letter dries, attach ribbon with hot glue as if you were preparing to hang the letter somewhere. Position the letter in the middle of the wreath and tie it around the back of the wreath. 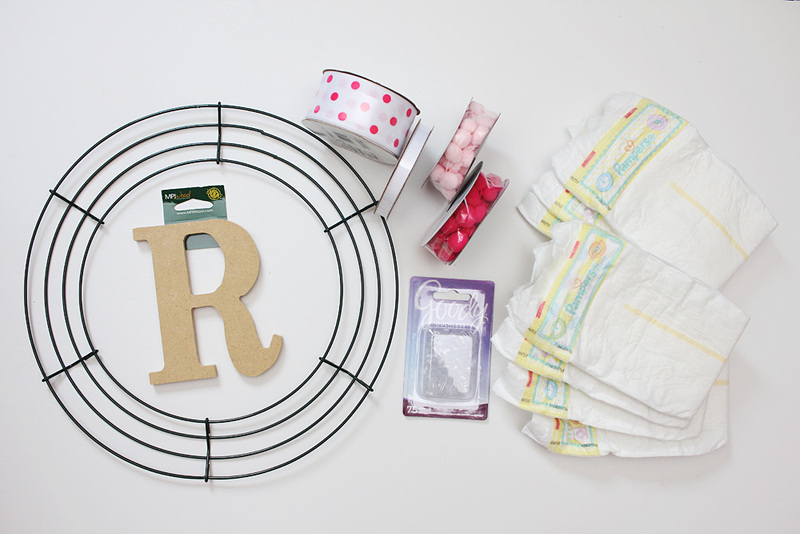 And there you have it – an easy and super affordable baby gift made with love! Share your projects with me by tagging me on INSTAGRAM, FACEBOOK, or TWITTER! 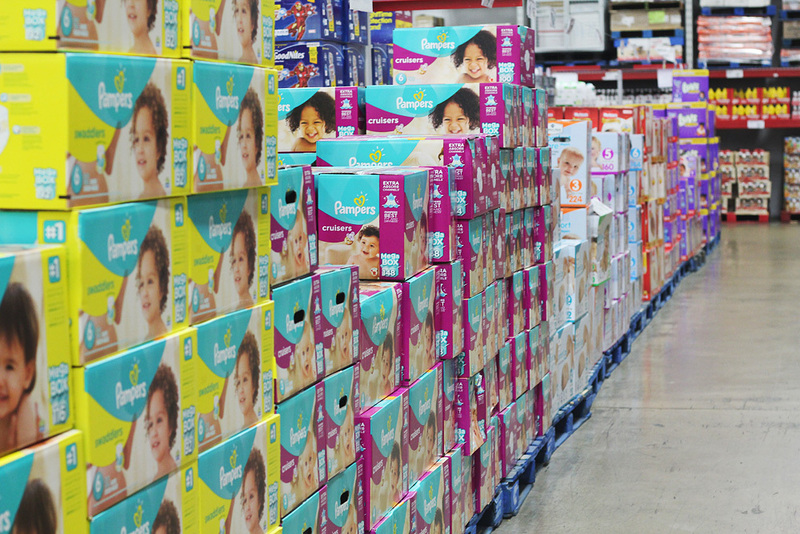 I loved buying diapers from Sam’s Club when my kids were wearing them. They have so many great deals! I love the idea of the diaper wreath! Oh my! This is such a great idea! I will be making this on my sister in law baby shower. That wreath is so darling! I can’t wait for a friend to have a baby so I can make one. What a great idea! 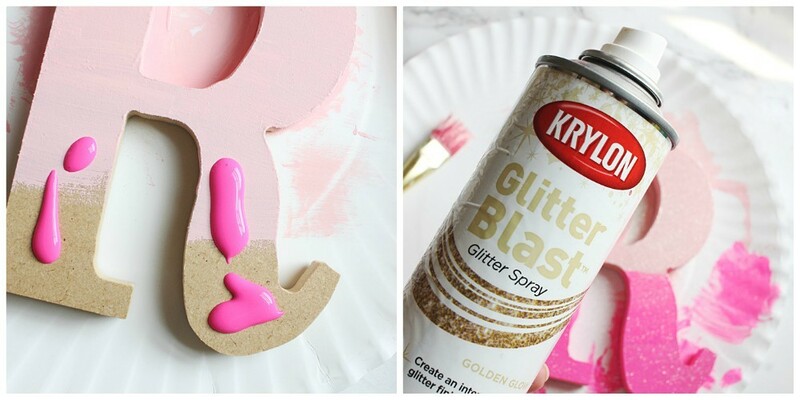 I am so making this next baby shower we have! That is a fun alternative to a diaper cake. I bet it would be a big hit at any baby shower. I love this idea! It is really easy too! What a wonderful gift for a shower. It is so cute! Oh gosh this is super adorable. 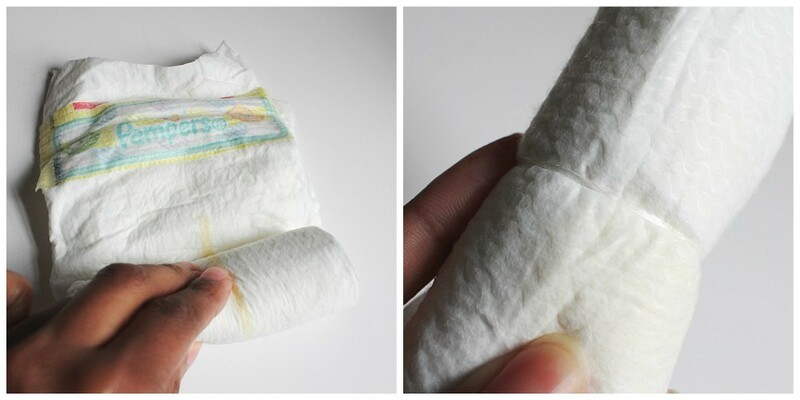 What a creative way to give a new parent some much-needed diapers. Love it. This is really cute! I love this idea, very creative! I haven’t been to a baby shower in so long! I think it’s awesome to give the expecting parents gifts that will help make their lives easier! 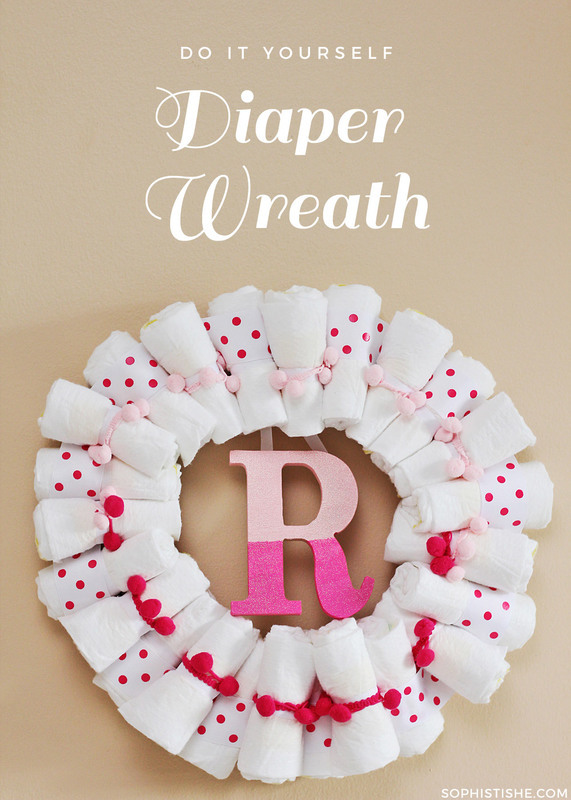 This diaper wreath is an awesome idea! I love it. Any mom would love to receive this for sure. Diapers are not cheap and babies need a lot! If I get to know of any friend or family member who is expecting, I will make sure I give them a diaper wreath. Wow, this turned out so cute! 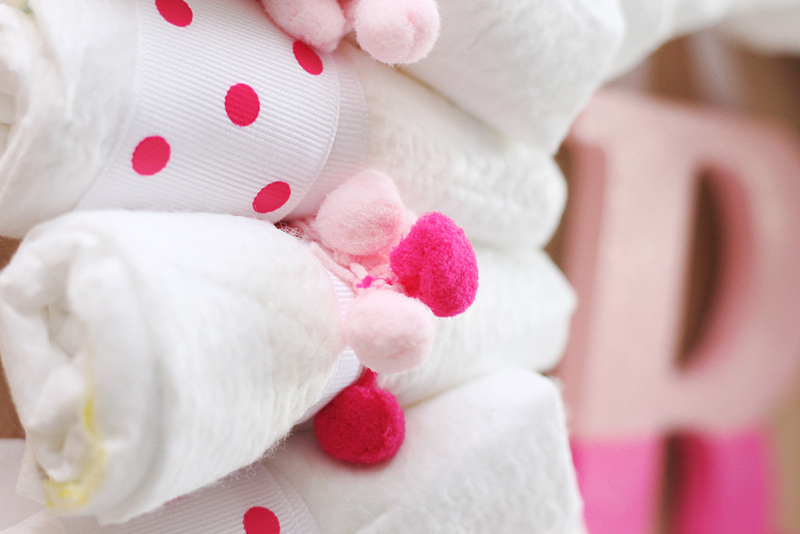 What a fun way to gift some much-needed diapers to a new parent! I love it! I always give diaper wreaths along with a couple of big boxes of diapers as a baby shower gift. Blankets are good, but babies just fly through those diapers! I love this! This is such a cute gift to give to any mom to be. Great job.